All beaches will be open weekends beginning Saturday, May 26. 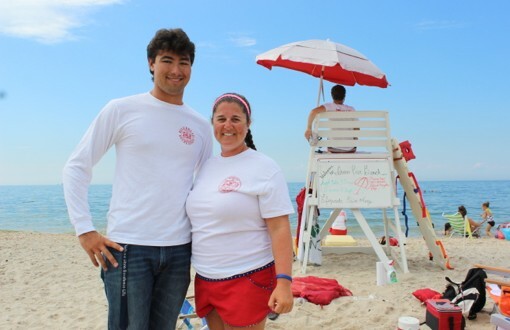 Lifeguards and beach attendants will be on duty from 10 am to 5 pm Saturdays and Sundays only (and Monday, May 28 for Memorial Day). All town beaches are open 7 days a week beginning Saturday, June 23. Parking permits are required at all town beach facilities from January 1, 2018 to December 31, 2018. ​Permits are available at the Shade Tree Center, 60 Shade Tree Lane in Aquebogue; the Parks Office, 55 Columbus Avenue in Riverhead; and at all town beaches from 10 am to 5 pm in season. If you would like to mail in your beach sticker application, please click here. A special permit is required for the use of the boat launch at the East Creek Boat Launch facility. A parking permit is also required for those leaving their vehicle/trailer in the lot. Applicants must produce a valid registration of the boat/vessel as proof of ownership. Riverhead Town tax bill or utility bill with residential service address. Name must match your car registration. No PO boxes. Utility bill with residential service address. Renter's name must be the same as car registration. Current license, registration, vehicle insurance. Limited to beach access/operation on Sound beaches. A night fishing permit is required to park in lots after 10 pm. Must possess annual parking pass and a valid marine fishing registry through the NYS DEC. Registry is free and can be done online, at the Town Clerk's office, or some sporting goods stores.